Updated on 16 March 2019. Hanna Öberg (born 2 November 1995) is a Swedish female biathlete. 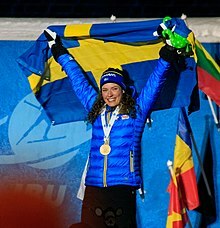 In 2017 she won the IBU Female Rookie of the Year Award for her World Cup debut season, with the male counterpart being awarded to her fellow Swede Sebastian Samuelsson. At the Pyeongchang 2018 Winter Olympics she won a surprising gold in the Individual, after four clean shootings. It was both the first victory and podium of her career, with her previous best being a fifth place in the world cup. She also claimed silver in the Relay, finished seventh in sprint, and fifth in both the mass start and the pursuit. Öberg repeated her Olympic success at the 2019 Biathlon World Championships on home snow in Östersund, where she again won the individual with a perfect shoot, having previously finished fourth in the sprint and fifth in the pursuit. She became the first female biathlete to win the individual World Championship title the year after taking the Olympic individual gold. She was awarded the Svenska Dagbladet Gold Medal in early-December 2018. and the Jerring Award in January 2019. **The single mixed relay was added as an event in 2019. Hanna's younger sister is Elvira Öberg, who is also a biathlete. Elvira won 3 gold medals at the Biathlon Junior World Championships 2018. ^ "Swedish Sweep: Rookie Awards to Hanna Öberg and Sebastian Samuelsson". www.biathlonworld.com. Retrieved 2 December 2018. ^ "Athlete profile – Hanna Oeberg". pyeongchang2018.com. Retrieved 10 February 2018. ^ "Biathlon: Women's relay results" (PDF). pyeongchang2018.com. Retrieved 22 February 2018. ^ Sharland, Pete (12 March 2019). "Öberg wins historic gold in front of home fans". Eurosport. Retrieved 15 March 2019. ^ Dave Russell (4 December 2018). "Radio Sweden" (in Swedish). Skier Hanna Öberg wins top sports prize. Retrieved 4 December 2018. ^ "Hanna Öberg fick Jerringpriset 2018" (in Swedish). Sportbladet. 21 January 2019. Retrieved 13 March 2019. "Lyckad OS-debut för Hanna Öberg – tog första topp tio-placeringen för säsongen". DN.SE (in Swedish). 10 February 2018. Retrieved 12 February 2018. "Hanna Öberg på femte plats". Norra Skåne (in Swedish). 12 February 2018. Retrieved 12 February 2018. Kurtoğlu, Özgür (12 February 2018). "Nytt succélopp av Hanna Öberg". Eurosport (in Swedish). Retrieved 12 February 2018. This page was last edited on 24 March 2019, at 16:36 (UTC).